The familiar voice of our flight attendant filled the humming cabin air through the PA system once again. I sat up and looked out of my aircraft window with much excitement, guessing that it must be an announcement to prepare for landing while she was still speaking melodiously in Dzongkha. The distant snow-capped Himalayan mountains we saw less than an hour ago had became velvety mountains in green and ochre within an arm's reach from the aircraft window. Our plane was no longer flying over mountains but between. The descend to Paro International Airport was swift, ephemeral and nerve-racking to say the least. The sense of anxiety grew as I continued to stare out of my window, watching the plane rolled and pitched its way between the narrow valley in search of its landing approach, with its silver wing tip gliding past the face of the mountain like a finger running gently along its topography lines. As the pilot skilfully manoeuvred the Airbus A319 through the narrow Paro valley, twisting and turning the 50 ton aircraft like a toy in a boy's hand, I was reminded that we were not approaching another award-decorated metropolis airport but one that has been named as the world's most dangerous to land. As the plane glided just metres above the Bhutanese houses at 150 mph, barely scraping their zinc roofs and finally making a safe landing on the air strip laid 2,280m above sea level, I was reminded that this wasn't just another mainstream holiday city but one of the most exotic and alluring destinations in many travellers' wish lists, including of mine. Indeed, this place is so special and sacred that only 8 pilots in the world are qualified to land on its short 2 km asphalt. It is so well hidden like a best-kept ancient secret, sandwiched and guarded by some divine power amidst a labyrinth of sacred valleys. "Tashi Delek." The flight attendant greeted while the plane taxied towards the humble airport terminal. Welcome to Bhutan - Land of the Thunder Dragon. Bhutan has always been a place we have wanted to visit as long as we could remember. Other than its genuinely gorgeous sceneries and immaculately preserved culture, the wedding of Hong Kong celebrities Tony Leung and Carina Lau had certainly added a touch of modern publicity to this exotic destination. Not forgetting their charismatic King and charming Queen of Bhutan who have touched and melted many hearts and brought the sleepy country out from the deep Himalayan shadows into the glamorous Hollywood spotlight. Without hesitation, we decided on our common available dates with 2 other friends from Taiwan and booked our flights straightaway. Honestly, we were all hoping and more eager to meet His Majesty King Jigme Khesar Namgyel Wangchuck and Her Majesty Jetsun Pema than seeing the famed Tiger's Nest. We booked everything through Druk Asia, a perfect one-stop centre for Bhutan travel arrangements (https://www.drukasia.com/). Using their many tour packages as templates, we were able to customise our itinerary easily through their helpful advisors. From air tickets and visas to reservations and payments, everything was done via email and internet banking. Alternatively, the friendly staff stationed at their office in Albert Complex (Singapore office) are always ready to meet and assist. There is no direct flight from Singapore to Paro International Airport. All flights transit at Kolkata, in which passengers need not disembark during the 40-min layover. There are only 3 flights per week from Singapore to Bhutan - on Tuesday, Thursday and Sunday. As Druk Air (Royal Bhutan Airlines) does not offer online check-in, you may wish to reach Changi Airport earlier for check-in if you want to secure a window seat. Many sources would suggest taking a window seat on the left as you will be able to see the majestic Himalayan range while traversing from Kolkata to Paro. 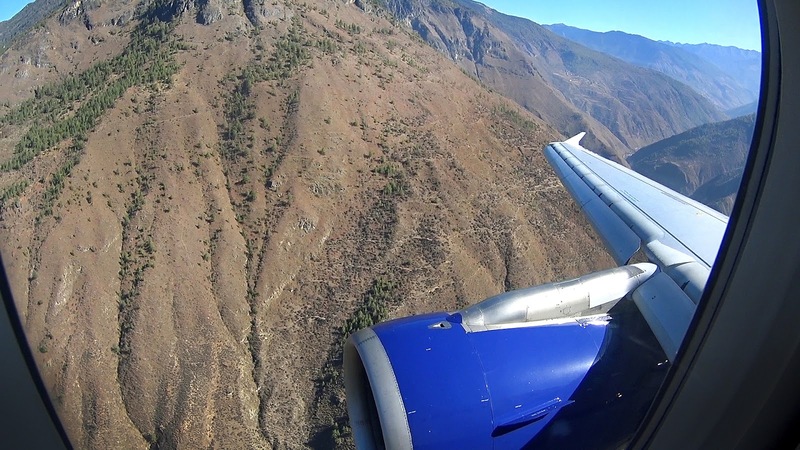 However, on descend into Paro, I personally prefer the views on the right side as the plane sweeps around the mountain. Ticket to happiness on KB501. Only 3 flights per week, all departing at 6.30am (8.30am in some months). The early departure is necessary as wind condition makes landing at Paro Airport after 12 noon more difficult. Happy meal. Simple but comforting breakfast on board. The distant Himalayan mountain range as seen from the window on the left of the aircraft when flying between Kolkata and Paro. Hopped over to an empty seat on the right for a new perspective. Every movable part of the wing could be seen working extra hard to manoeuvre the plane. Descending and getting closer to the mountains - twisting, turning and gliding through the valleys for landing. Seriously, the mountains felt much closer in reality than the photo suggests. The Paro International Airport terminal building. Disembarkation and immigration were swift and hassle-free. Our guide and driver were already waiting for us at the arrival hall, holding my name high and clear. There is no aero-bridge or carpeted arrival lounge. But walking out of a passenger jet sitting in the middle of a valley felt rather intriguing. Despite being only half the length of Changi Airport's runway, landing was swift and smooth. A big salute to the skilful pilot! And you may take your time to take pictures with the plane, the airport security didn't seem to mind. Our driver, Mr. Sangye (middle) helping with our luggage. All travellers in Bhutan will get their personal guide, driver and vehicle, except for those on big tour groups. Hence, the USD250 per person per night (peak season) or USD200 per person per night (off-peak season) is very reasonable. Not forgetting that it includes accommodation and all 3 meals daily! Our first stop was the Tachog Lhakhang and the iron chain bridge across the river Paro Chhu. It's located conveniently along the way from Paro to Thimphu, which was where we were heading. Prayer flags adorn the bridge, fluttering prayers and blessings for more than 600 years. The bridgeheads on both sides of the river. The iron chain bridge from one end to the other. Anchoring the iron chains for centuries. After just 45 minutes from Tachog Lhakhang, we reached Thimphu for lunch. Our first happy meal in the Land of Happiness. Surprisingly, Bhutanese food was very delicious and suited our taste buds very well. Our first stop in Thimphu was the National Memorial Chorten. It was built in 1974 as a memorial to Jigme Dorji Wangchuk, the third king of Bhutan (1928-1972). There was a big prayer event at the National Memorial Chorten, with hundreds of locals gathering at the compound. The majestic and iconic stupa of the National Memorial Chorten, also known as the Thimphu Chorten. The locals were always friendly and happy to pose for a photo. Starting to feel the real happiness of the Bhutan people. A local standing in front of giant prayer wheels. Arrived at the Buddha View Point. At 169 feet tall and perched high on the mountain of Thimphu valley, the shimmering bronze and gold-glided statue of Buddha Dordenma can be seen from anywhere in Thimphu. It's known to be one of the largest seated Buddha statues in the world. A short 20-minute drive from Buddha View Point is the Motithang Takin Preserve, home to Bhutan’s national animal, the Takin. Locals and caretakers at the Takin Preserve. It wasn't easy getting a good look (or a picture) of this shy and beautiful animal. Day one's programme was light and easy. Thanks for our considerate guide, Mr. Jigme Dorji, whom we could always discuss our lazy plans with. We were not ambitious about our itinerary and wanted to take things slowly. Hence, we headed to our hotel and checked-in by 6pm. A great view of Thimphu valley from our hotel room. See if you could spot the golden statue of Buddha Dordenma perched on the mountain. Buddha spotting with the help of 300mm (200mm with 1.5X sensor crop setting on my D750). We stayed with Hotel Osel in Thimphu. We did not specify our hotel preferences and they were selected and booked by Druk Asia based on availability, as we were not fussy and there wasn't a lot to choose from in each city anyway. To our pleasant surprise, Hotel Osel was clean, spacious and well-equipped. And best of all, the main shopping streets of Thimphu is located less than 10-minute walk from the hotel. Decided to take on the streets of Thimphu and soak in the local street atmosphere. Presumably, this is the "Orchard Road" of Bhutan - the capital's main shopping street. Fresh produce along the alleys of Thimphu. Bhutan still relies significantly on food imports from neighbours like India. Locals transacting in a rather unusual meat shop. It's dinner time and back to the comfort of Osel Hotel. The hotel restaurant was clean and spacious. Service was also impeccable! Thanks to Mr. Pema Dorji at Osel! Our sumptuous dinner spread. The warm and hospitable hotel staff had never failed to attend to our needs and were always checking on us. Mr. Pema was always asking if the food had suited our taste and the kitchen could always adjust accordingly. We were really amazed by their superb service. From the contagious laughter of our tour guide and driver to the blushful charming smiles of every Bhutanese we had met along the way, perhaps, happiness is really a place on Earth. Reading your blog actually took me to Bhutan. Your perfectly detailed description made me feel as if i was travelling myself. I ll make sure to add it in my next travel destination. Hi there. Thanks for posting this as I am planning a trip to Bhutan in Dec. My concern is the weather. I am likely going mid - end Dec. Would the temperature be colder? In addition, may i know if toilets are easily available as well as the condition? Thanks for addressing my concerns! Hi hi. Yes, I believe it will get colder towards mid/end Dec. Day time should be fine (and warm) as the sun can be quite harsh. Plus all the walking/trekking, you should not be feeling cold, except when under the shade. However, the nights can be very cold. The coldness do get into the hotel room and some heaters may not be very effective. So do bring along warm pyjamas, socks, etc. Sun is strong, so bring your sunglasses. Public toilets are not easily available when travelling between towns. But all lunch stops will have decent toilets. They are not luxurious for sure, but are not dirty and do have toilet rolls mostly. However, toilets at some attractions can be quite bad. The worst we encountered was at the foot of the hill before ascending to Tango Monastery. Hope above helps. Let me know if you have any other questions. Have a great trip! Haha thanks! Are the water heaters in the hotels sufficient? I read that sometime it might stop working! hats off to this amazing photography. Are you searching for the Jobs in State and Central Government? If yes, then you have come to the right place. Our website “Sarkari Jobs” will get you all the fresh recruitment notifications from various State and Central Government Organizations. It is important to clear basics in order to prepare for entrance level exams. And this requires apt study material and solving tricky numerals along with an efficient revision. NCERT books are considered to be the easiest that puts out concepts clearly, without diving deep into the complex theories. WWE 11 download free Games For PC with working command. Wonderful blog with such a useful information, i really like it. There are many Taxi rental services in Bangalore ,Car rental packages bangalore ,Book cab online in bangalore ,Cab rental Services in bangalore ,Cab Hire in bangalore ,Taxi Rental Company in Bangalore,Mini Bus rental in Bangalore,Tempo traveller rental in bangalore ,Tempo traveller hire in bangalore ,tempo traveller rental bangalore ,tempo traveller rental company in bangalore ,Tempo traveller for outstation bangalore ,Travel agents in bangalore for easy travel. Your blog is very informative, meaningful and to the point. Being a traveller blogger i find you have a very good writing sense due to which you explain details about many destination perfectly, Your blog is like books of Lonely planet for various travel destination. If someone required destination information your blog is enough instead of searching anywhere. Keep it up your meaningful blog writing. I recently returned from an Amazing Indian Golden Triangle tour Package which was arranged by Ghum India Ghum, travel agent in Delhi, you can tie up with them if you want.